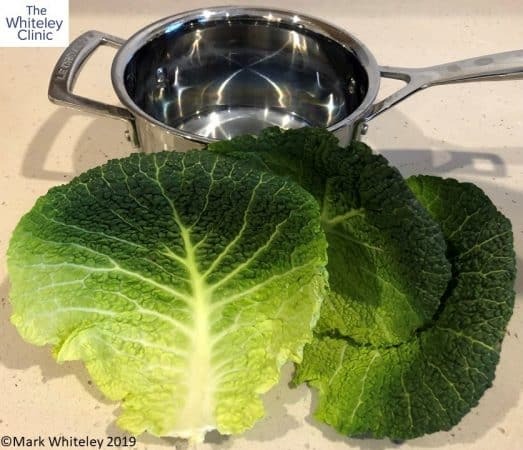 Steamed cabbage leaves dressing for a venous leg ulcer? Yesterday, my partner and I were at a lunch event. It just so happened that we were sitting next to one of my patients and his wife. This patient had been suffering from a leg ulcer on the left side. He had previously had a leg ulcer on the right side. The patient still had brown skin (haemosiderin) showing where the ulcer had been. He had come to The Whiteley Clinic to see if he was curable. At The Whiteley Clinic, he underwent venous duplex ultrasonography. This is the recommended course of action under NICE clinical guidelines CG 168. The National Institute of Health and Care Excellence (NICE) produces guidelines for clinical medicine. NICE CG 168 is called clinical guidelines for varicose veins. However, in the recommendations, it also covers venous leg ulcers. It defines a venous leg ulcer as “a break in the skin below the knee that has not healed within 2 weeks“. It also covers venous leg ulcers that have previously healed by compression. The reason for this is they are highly likely to recur if the underlying cause has not been corrected! The recent EVRA trial showed that venous leg ulcers healed quicker if the underlying veins were treated with endovenous surgery than if dressings and compression were used alone. The previous ESCHAR trial has shown that surgery to the underlying veins reduces the risks of the leg ulcers coming back. Unlike using compression and dressings, surgery of the underlying veins gets to the root cause of the problem. Our own research has shown an 85% long-term healing rate of venous leg ulcers when the underlying veins are treated. The patient himself recently completed The Whiteley Protocol. This staged the treatment of the underlying vein problem, ensuring the best possible results. Our experience shows that this will lead to healing of the ulcer in 8-12 weeks. There is also a very low chance of ever getting a recurrence of the ulcer. The dressing used on the ulcer itself is irrelevant. 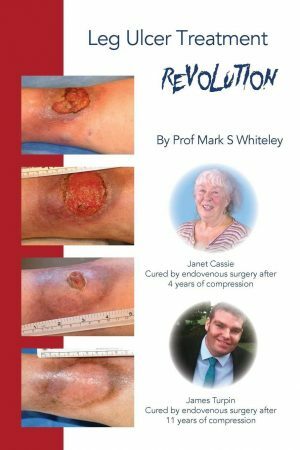 For those who don’t want to read the scientific papers, this is all explained in the simple book “Leg Ulcer Treatment Revolution“. It also highlights two patients who are currently suing their previous doctors and nurses for failing to refer them for curative surgery! Notwithstanding this, the patient’s wife told my partner about steamed cabbage leaves. she explained that a friend of theirs, who knows a doctor, had recommended steamed cabbage leaves to cure the leg ulcers! She declared that since she had used steamed cabbage leaves, the ulcers had improved considerably. Of course, this would be far more impressive if he hadn’t already had the curative endovenous surgery! Now that we have treated his underlying veins, anything at all put on the ulcer will appear to be effective. The ulcers are going to heal because the underlying cause has been removed. It is not because of anything put on the ulcer surface. I am certain that this same lady would have a very different opinion if it were her house that was at risk. Imagine if she had noticed cracks in her walls. Would she be sensible to have someone paint over the cracks, without checking why they had appeared first? Imagine how angry she would be if she were charged for painting over the cracks, only to find in the long term that the foundations of the house were inadequate. Because this is a house, people can understand it. In medicine, those of us involved in venous research have known since 1992 that most venous leg ulcers are due to hidden varicose veins. Fixing the hidden varicose veins will result in the venous leg ulcer healing. Dressings put on the leg are irrelevant. Compression is only temporary. We don’t need long term compression in most patient now. It is for this reason that the NICE CG 168 guidelines recommend that everyone with a venous leg ulcer needs to be referred for a venous duplex ultrasound scan. If this happened, we would be able to permanently cure well over 50% of all of the venous leg ulcers. In the UK, this would save the NHS £2-3 billion a year. Unfortunately, such commonsense and good news for both patients and the taxpayer is much less attractive than the promise of a magical cure by “steamed cabbage leaves”.